I’ve been toying with the idea of making quilted pillow covers for a while now, and a recent visit to a shop that is looking for submissions finally gave me the kick in the pants I needed to do it. I still don’t know if I will pursue selling them, but at least now I have an idea of time and material costs. For the record, it took me 3 hours and 6 minutes from cutting fabric to zipping it closed. This uses leftover fabric from the Baby Pyramids quilt, though it didn’t save me any time in cutting. 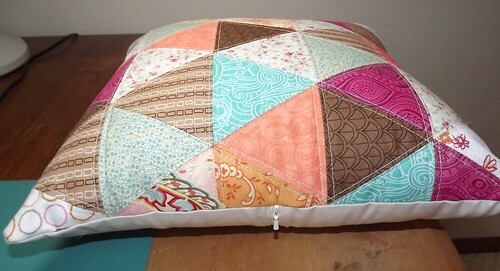 I cut the triangles smaller for this pillow, so everything was cut new. It is pretty easy to cut and piece equilateral triangles (and I’m a little obsessed with them now), so I’d say this is comparable in time to making a cover of 3″ squares. I used an invisible zipper because that’s what was handy. The front is quilted and the back is a double layer of solid fabric. I’ve made covers with envelope backs and they’re quick and easy, and look fine, but I wanted something a bit more finished if I try selling them. Sewing a zipper in is not at all difficult, and I really like the way it looks, especially using the invisible zipper. Good thing I have quite a few from when our local Hancock Fabrics went out of business (six years ago). The pillow is nice and firm because I used an 18″ pillow form inside a 16″ pillow cover. I don’t remember where I read that tip, but it makes all the difference. I don’t think it would work as well with an envelope back, though. By pure luck, I happened to see the Pillow Collective link up at Amy’s Creative Side, so I’m joining in. Now on to the next one! That is a pretty pillow. You’ll get faster as you make more of them, unless you do like me and make them all one-of-a-kind. lol I get bored with doing the same ole thing. I really like the triangle design. 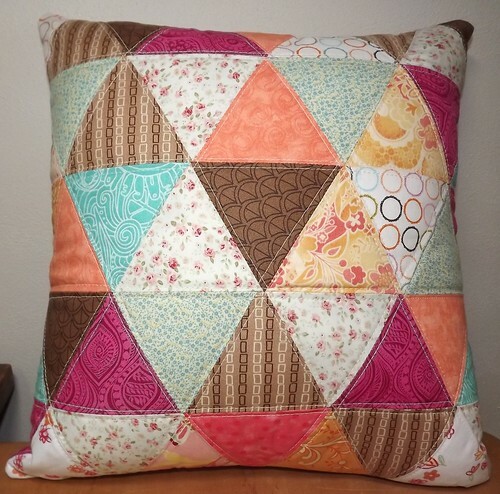 Very pretty pillow and great colors!